For the ultimate breath-taking…rod-bending…light-tackle fight of a lifetime – if you have never hooked into a King Salmon, this trip is a must-do! King (Chinook) Salmon are the largest Salmon in the Pacific Ocean. 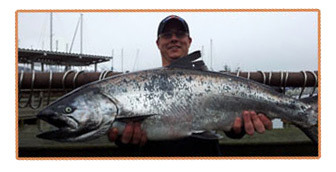 King Salmon range from 20 to 60 pounds and up. We target these feeder Kings for eight to ten weeks at the beginning of the season until the Silver (Coho) Salmon start to show up. We fish for King Salmon by trolling, with the boat moving at low speed, drawing lines through the water at different depths, dressed with lures or bait. Our captains have been fishing for Kings for several years in these waters and are “dialed in” to what entices these finicky feeders. The limit for these wild ocean King Salmon is one or two per person per day, depending on the area fished. July 10 (sooner if available) through September 2. 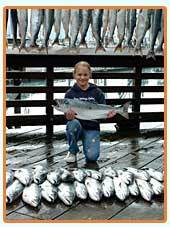 Fishing for Coho Salmon, known in Seward, Alaska as "Silver Salmon", is some of the most exciting sports fishing on light tackle. Alaska Silver salmon weigh approximately 8 to 12 pounds when they first arrive to Resurrection Bay in late June to early July. Their ravenous feeding throughout the season pushes their weight to 15 pounds or more by late summer. These feisty, acrobatic silver bullets often dart at high speeds and leap up and out of the water only to splash back down to challenge you once again to the fight of a lifetime. We commonly get two, three, four, or more Salmon on simultaneously, though hooking a silver is only part of the battle. Getting these fish netted and into the boat before they shake your hook is an even greater challenge. We typically mooch for Silver Salmon. "Mooching" is a technique where each person jigs their hook baited with a small piece of herring. When the fish bites, the hook gets set and the fight is on. You will find this is a more effective technique than troll fishing when the fish are schooled up and allows the angler to feel the bite. The catch limit for Silver Salmon is six fish per person inside Resurrection Bay and three Silvers each when caught outside the bay. An aspiring ichthyologist? 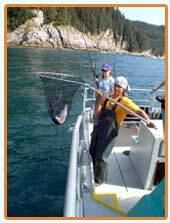 Learn more about Alaska silver salmon at the Alaska Department of Fish and Game website. 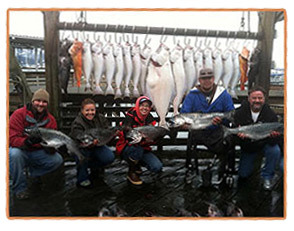 The Seward Silver Salmon Derby®, sponsored annually by the Seward Chamber of Commerce, is one of the oldest fishing derbies in Alaska, with 2019 marking the Derby's 64rth year. Multiples prizes are awarded in several categories, with the "2018" winner taking home $10,000 for the largest Silver. The $50,000 tagged fish was one that got away! The dates for the 2019 Seward Silver Salmon Derby® are August 11 to 19. Tickets are $10 per day and $50 for full event, and will be available for sale in our office. Proceeds from Silvers turned in are used to support Fish Enhancement programs to increase Salmon stocks in Resurrection Bay. Sound good? Make your Alaska Silver Salmon fishing trip reservation now!